Sarah and I have been meaning to grill together for ages. Inevitably, we gather all of the ingredients and our courage to cook with charcoal, and then it pours rain. 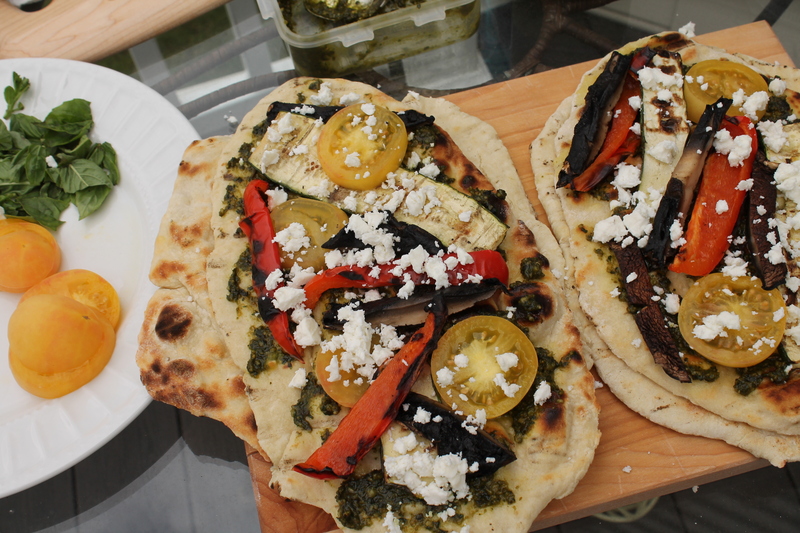 But this week we were determined, rain or shine, to grill some veggies and some flatbreads! Naturally, on the big morning, the rain clouds rolled in. But for once, we decided not to be deterred. And I am so glad we stuck to our guns! This flatbread “pizza” was simple and tasty. 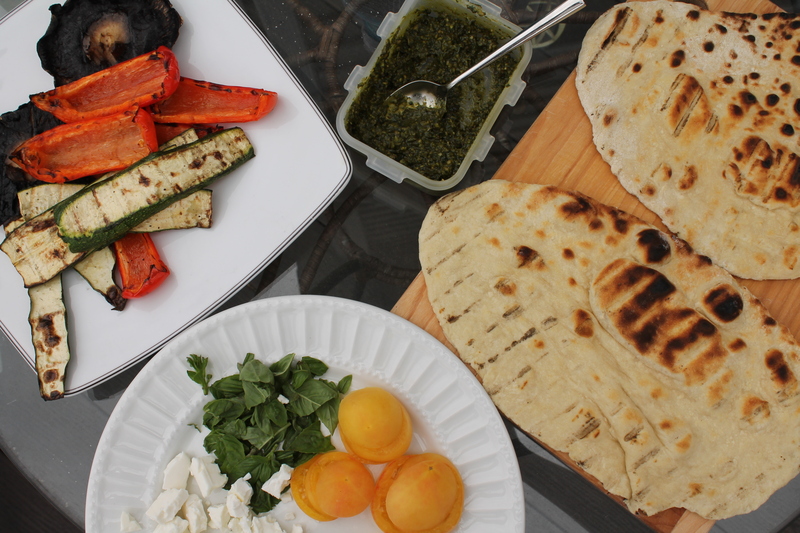 Bright, fresh summer veggies were so easy to throw on the grill, and we even made a quickie no-rise flatbread dough and threw that on the grill as well! With a little bit of chopping and stirring, and a few quick minutes on the grill, we turned out an absolutely delicious lunch! The first step is just to stir together a super quick dough. You can make this in the food processor or stir it by hand! Just toss flour, salt, baking powder, water, milk, and oil into a bowl and stir it together. 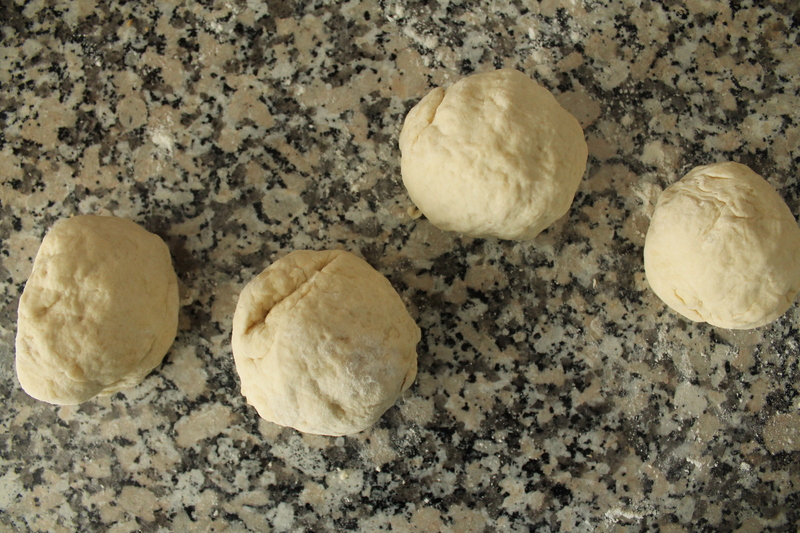 Divide the dough into 4 equal pieces, kneading lightly on a flour-covered work surface and forming into balls. Roll the balls out as large and flat as possible. No need to make them perfectly circular! 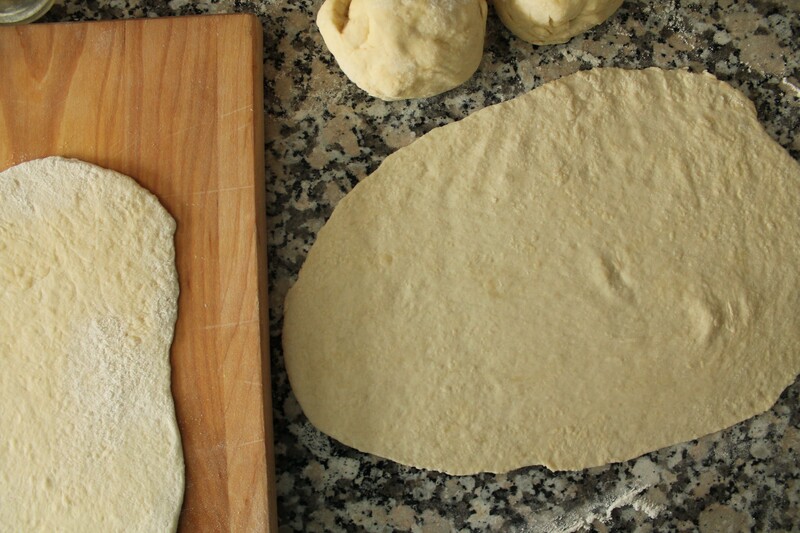 Rustic oblong shapes are great for flatbread. Next, let’s prep some veggies! There isn’t really too much chopping for this meal: just cut the bell pepper into large chunks, and slice the zucchini. Sarah and I scraped the gills out of the mushrooms so they would grill faster and release less moisture. Very lightly brush the veggies with a bit of olive oil and sprinkle salt and pepper over them. Aaaand place them on a hot, lightly oiled grill grate! The pieces are large enough that you should be able to place them straight onto the grill without using any kind of grill basket or foil layer. This will allow the veggies to get a nice char and some good smokiness. I, personally, did not do any grilling this time, as I was wearing a baby in a baby carrier and didn’t want to risk burning her little feet. Therefore I have no grilling advice for you. I will say that vegetables tend to cook quickly, and that one of the important goals for the mushrooms particularly is for the moisture to release and the veggies to get a little drier, so that they don’t make the pizza soggy. While you grill the veg, there is a bit more prep to do! We need chopped tomatoes, pesto, feta, and basil in order to assemble the pizzas. Pesto is so easy. You can prepare it any time and keep it in the fridge for up to 2 weeks. I like to make my pesto with basil and spinach. Just blitz equal parts spinach and basil in the food processor with garlic, toasted pine nuts, fresh grated parmesan cheese, and olive oil. I kept my presto a little on the drier side for the pizza, so it would spread a little thicker and not soak into the bread too much. Taste and season with salt and black pepper as needed. Of course, you can definitely substitute pre-made pesto here. It will still be tasty! When the veggies are grilled, pull them off the grill and set aside. Slice the mushrooms thickly. We also cut our bell peppers down into thinner strips. Carefully lay the flatbread on the grill. This is a perfect flatbread for grilling, because the dough is not so soft that it will sink through the grill grate. Ours crisped up on the bottom and bubbled immediately on the top! Flatbread only needs a few minutes on each side to be cooked through. Sarah wisely cooked the first side about 1 minute, until large bubbles formed all over the top surface, then she turned the bread over with a spatula and grilled about 2 minutes on the second side, until the bubbles were dark. We pulled the flatbread off the grill to top it! Spread your pesto on the bubbly side of the flatbread. Top with sliced tomatoes (many thanks to my friend Jess for giving me some delicious peach tomatoes from her garden! ), the grilled veg, and crumbled feta. Carefully return the flatbreads to the grill for another minute or so, to finish cooking the bottom of the bread and warm the toppings slightly. Don’t expect the feta to melt! Feta is so low in fat that it takes a lot of heat to melt it; while we want a crispy crust to hold our flatbread, we would totally burn the crust to a crisp if we were to keep cooking until the feta melted. Yum! What a great reason to ignore some rainclouds and heat some charcoal! Heat the charcoals for the grill and let the grill begin to get nice and hot. Mix together all the ingredients for the crust using a wooden spoon. Divide into 4 equal parts. 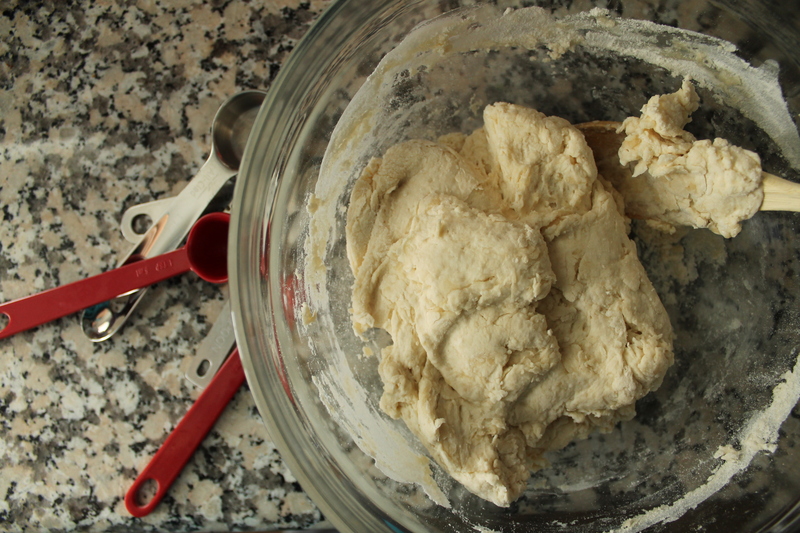 Knead each ball a few times, then roll out as flat as possible into oblong or circular shapes. Set aside. Make the pesto. 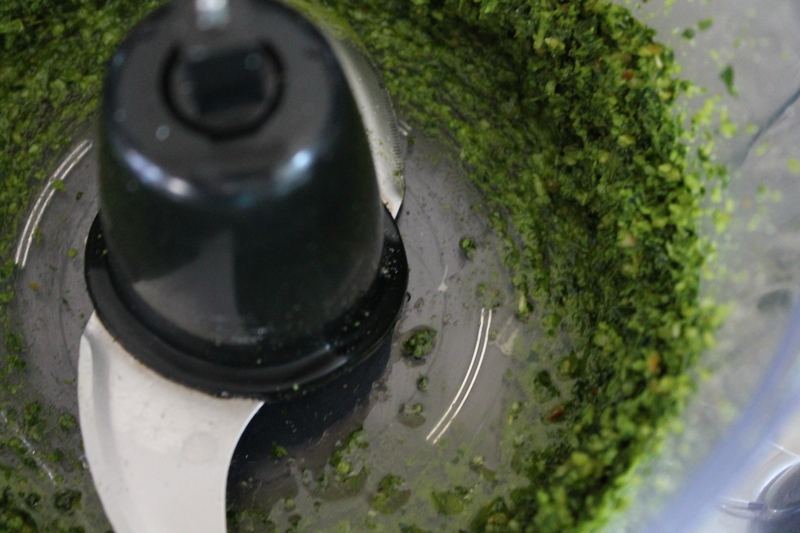 Combine the greens in a food processor and pulse until broken down. Add the garlic, pine nuts, and parmesan and process until fine. With the food processor running, stream in the olive oil. Add or subtract olive oil to taste, but try not to let it become too loose for the purpose of spreading on flatbread! Lightly season the pesto with salt and pepper. Taste and adjust seasonings as needed. Set aside. Prep the veggies. Slice the zucchini into long strips. Clean the seeds and membranes out of the bell peppers and cut them into large pieces. Scrape the gills out of the portabella caps. Very lightly brush the veggies with oil and season with salt and black pepper. The grill should be very hot at this point. 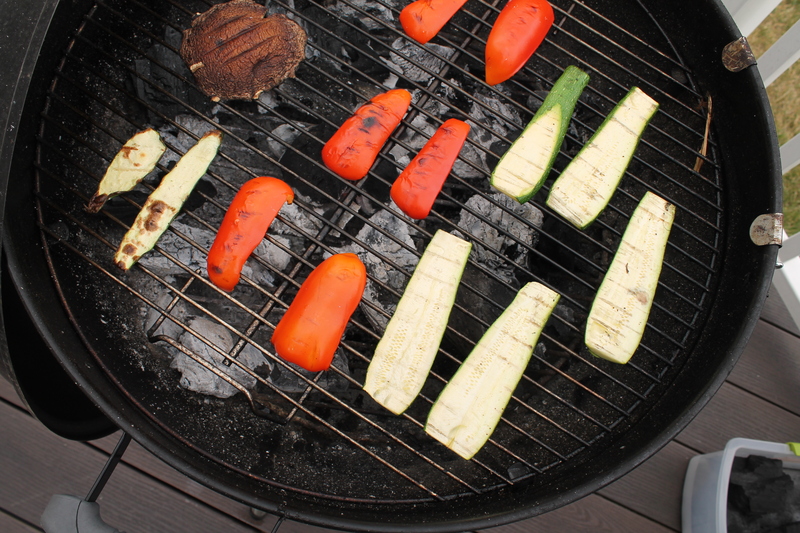 If necessary, brush the grill grate with oil so the veggies don’t stick. Grill the veggies until they release all their moisture (especially the mushrooms) and become tender and slightly blistered, at least 2 minutes per side. Remove the veggies from the heat. 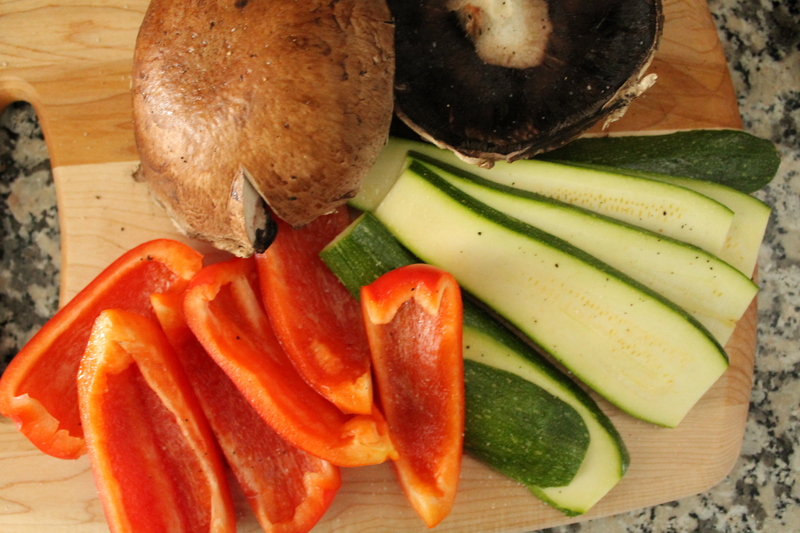 Thinly slice the grilled mushrooms and peppers for topping the pizza. Set aside. 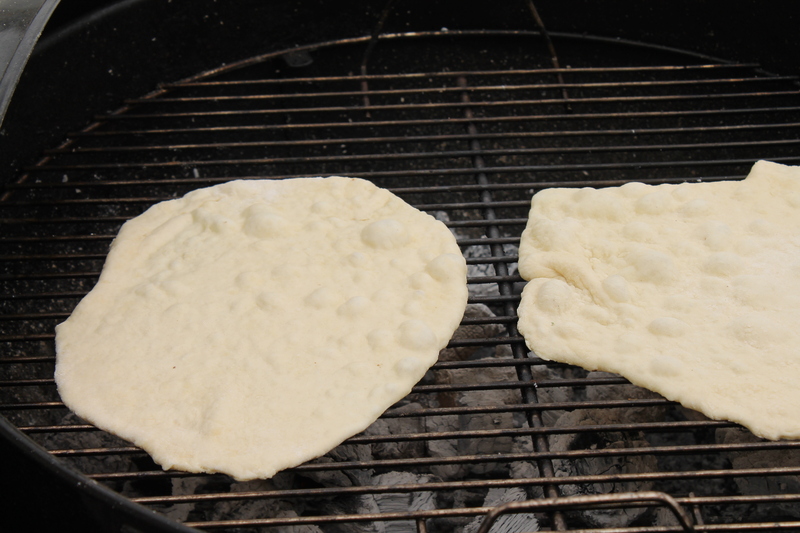 Cook the flatbreads on the grill for 1 minute, until bubbled all over on top, then flip and cook another 2 minutes. Remove from the heat. 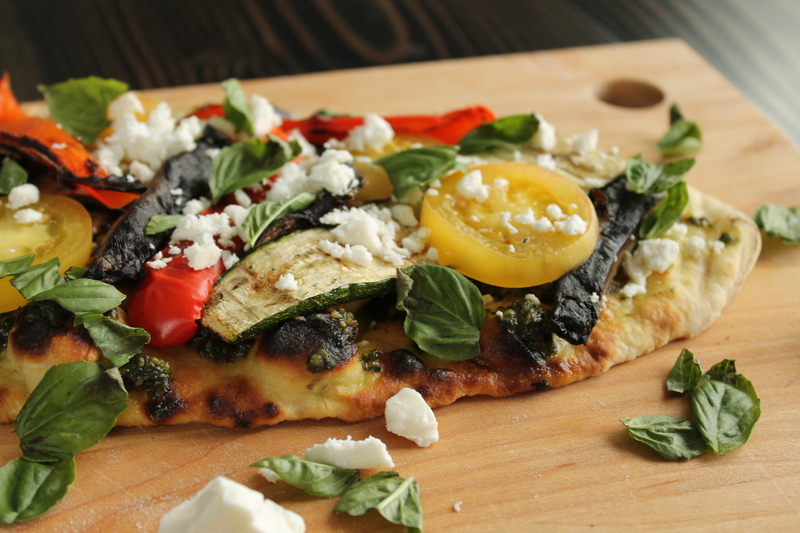 Top the grilled flatbread, bubbly side up, with pesto, grilled veggies, tomatoes and feta. Return to the grill for 1 minute, to warm the veggies and finish cooking the bread. 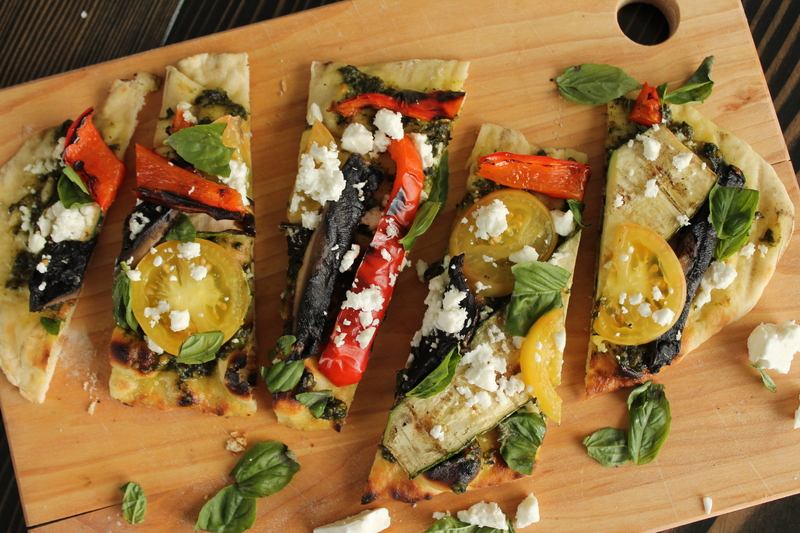 Sprinkle basil over the flatbread and eat warm. Such a good idea! I’m glad we beat the rain! Looks amazing so I reblogged it. Can the flatbread be made with gluten free flour?? Amanda, I’m sure it can! If you have a favorite GF AP mix, just substitute it by weight (I believe 1 cup wheat flour is 4.25 oz) and don’t forget the xanthan gum! I would try it on a cast iron pan first, though, and assess whether the dough is firm enough not to fall through the grill grates by observing what it does on the flat surface. Good luck! Thank you for sharing this fabulous recipe! Your flatbread looks divine. Thanks for the shout-out for my pesto recipe!